Back in April of 2011, we had a conversation with the missionary team here. They invited us to come join the team but noted that they do not have a place for us to live on campus with the rest of the missionary team. As we prayed and began processing this news, it was very hard for me. But we believed that this was the place God was calling our family to serve. So we decided to come and to raise the support necessary to build a home here. Honestly, each step was a very hard emotional and spiritual struggle. We were confident in the fact that this is what God was calling our family to do, but it was very hard for me to leave our "home." Our home in Georgia is where we had lived for 11 years. We loved having family and friends over for meals, backyard cookouts and play dates. Our home was not large by American standards, but it was perfect for our family! As we were preparing to move to Uganda we knew we would need a place to live until our house could be built on campus. We had some people looking for a place for us, and nothing seemed to be available that would work for our family. Then we heard of a house that would be available here in Jinja during another missionary family's furlough. The best thing about this situation was that it was furnished and ready for us to move in. We were glad to know that we would have a house for our family for our first 4 months here. Then we found out that a missionary family at GSF would be going on furlough and that we could use their home for the next 6 months. It was originally our hope that our home might be built soon after that. This week we realized that it will probably be at least another year after that until our home is built. There are several reason for the delay, and we don't know for sure that it will take that long, but I have been struggling a bit thinking of all the transitions in the years ahead. 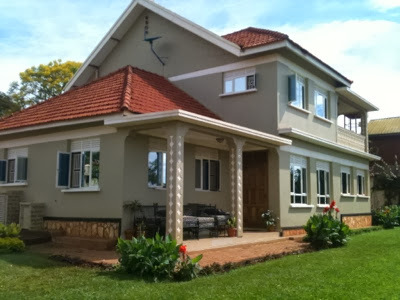 After living in the same home for nearly 12 years, we have moved to a missionary guest house in Georgia for a few weeks, then 3 days on campus in one house at GSF here in Uganda, then 4 months in Jinja. Next we will be moving for 2 weeks to another house on campus at GSF, then 6 months in our third house on campus at GSF, then God only knows where to next. Honestly I have been a bit discouraged and feeling sorry for myself about this feeling of being "homeless." But as soon as that word came to mind, I realized that I needed a change in perspective/attitude. The first thing I realized is that even though we have not been able to stay in one home, God has always provided us with a place to live, which is much more than we need. Here is a picture of the amazing house we have had the privilege of living in for the last 3 months. I have never lived in such a big, fancy house. It has been a blessing to have this nice house to use for several months. And there are definitely some benefits to living in town. We have learned a lot about Jinja since we are here every day. And we have made good friends with other missionaries here. Since I think of home as a place of rest and comfort, I also read this passage. “Come to me, all you who are weary and burdened, and I will give you rest. Take my yoke upon you and learn from me, for I am gentle and humble in heart, and you will find rest for your souls." (Matthew 11:28, 29 NIV) The comfort of our eternal home is not just that it will be comfortable, but that our God will dwell with us! Here is a description of my true home and I will fix my eyes upon this. It is my desire that each time I long for home, whether thinking of our home in Georgia or a home to be settled in here in Uganda, that instead I would fix my eyes on Jesus and my eternal home, that I "will not grow weary and lose heart." (Hebrews 12:1&2) Whether we are in America or Uganda or somewhere else, we are "foreigners and strangers" on this earth. Because our true Home is with our Father in Heaven! And that Home is forever! Amen, sister! Joni Eareckson Tada wrote a book entitled "Heaven" that had a profound impact on my perspective in terms of living for our true home. I hope you are surprised by unexpected blessings in this next "temporary home" you are headed to.